The redevelopment of Prince Edward County Memorial Hospital is a building project on the ‘moo-ve’ thanks to a donation from some community-minded dairy producers. 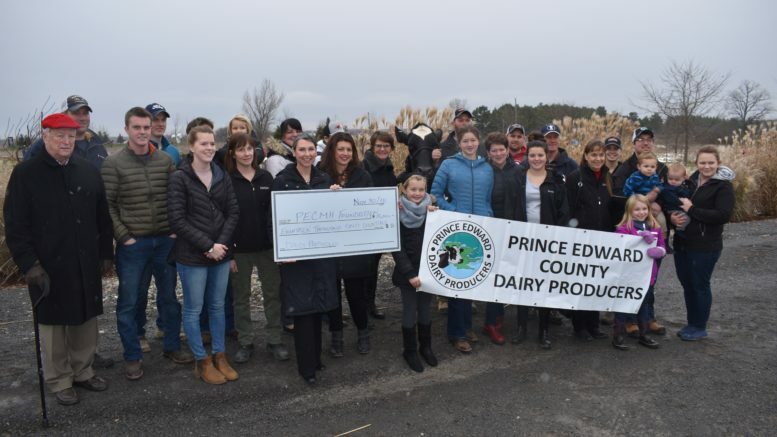 A group of Prince Edward County dairy farmers gathered at Huff Estates Winery on Friday afternoon to present the Prince Edward County Memorial Hospital Foundation with a cheque for $18,000 (and counting) to be added to the ‘Back the Build’ campaign. Joined by an excellent example of a Holstein dairy cow named Talina from Prinsville Farms in Bloomfield, a number of dairy farming families met with foundation members and supporters just outside Oneo Gallery to make a formal cheque presentation. The presentation was an poignant one for Foundation Chair Monica Alyea who herself grew up on a dairy farm in Hillier and was involved in 4-H for a number of years in Prince Edward County. “Hospitals are a very important part of farms because it’s a hazardous occupation for the entire family and it’s really exceptional that the dairy farmers in Prince Edward County are not just stepping up and providing food but they recognize that we need this hospital to be sure we have the services we need in this county,” Alyea said. Spearheaded by Gilead Rd. Dairy producers Phil and Selena Prinzen, the initiative to contribute a significant amount of funds to the local hospital redevelopment project was a way for a dozen and half (and counting) local milk producers to say thanks to a caring community that stays committed to buying products with the little blue cow logo on it that signals it’s a Canadian Dairy product. Currently, the campaign has received around $10.5 million of its $16 million goal through donations or written pledges. A redeveloped PECMH is expected to open its doors in 2025. An early ‘Dairy Christmas’ present from community minded producers help illustrate that any group from any sector in Prince Edward County can get together and support a project of significant importance that impacts the lives of ever citizen living and working and visiting this island. “Gifts from local groups, like the Dairy Producers, speak to the importance of community involvement and the impact that it has on the quality of care for those residing and visiting our County and who use our hospital. We are so thankful for the Dairy Farmers’ support and interest in the future of our hospital,” added Coull.